Raising awareness of mens' health and wellbeing. There are countless opportunities for individuals, groups, clubs, schools, universities and businesses to raise awareness and funds to support our vital work. We’re passionate about promoting health and wellbeing for men. To encourage men to take positive action to safeguard their health and wellbeing, including encouraging men to visit their doctor more often. In short, we empower men to take responsibility for their health, by providing positivity, passion and a push. We also provide links to quality information and support, and encourage men to look after themselves better. 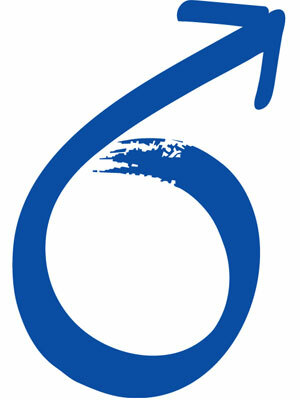 The Blue Ribbon Foundation has no paid staff at present, so there are limits on our activity. However, we provide talks to men across the country about their health, write widely on men’s health issues for a variety of online and print sources, and provide a signposting service for men and their families, pointing them in the right direction towards advice and support offered by other charities or the NHS. If you would like to arrange a talk for men at your organisation, company or other venue, do please contact us. It is our belief that by working together with other charities in education and awareness campaigns, many male lives can be saved. Too many men are dying too young, or suffering from avoidable health problems, partly as a result of a lack of awareness of health issues and not seeking help soon enough. We’re here to push positive health and wellbeing for men, as well as encourage them to seek more support from friends, families or doctors. 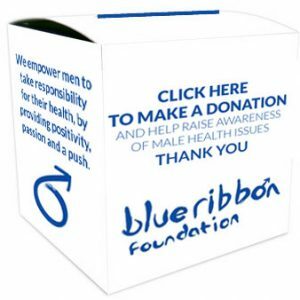 And remember – whenever you see somebody wearing a blue ribbon, they are aware and have made a contribution towards support men’s health and wellbeing! Please support our efforts! 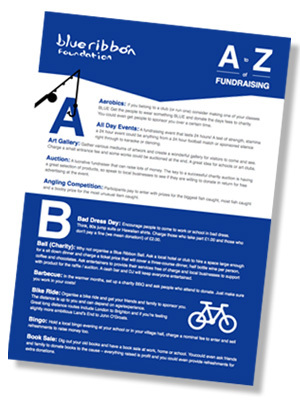 Have a look at our A to Z of Fundraising ideas leaflet. It’s full of over 100 great things to do from Aerobics and Kiss-a-thons, to Zombie parties. There’s bound to be something right up your street. Click on the image opposite to download a PDF.